The student union is a focal point for the campus community and an interactive connection to the public in Las Vegas. 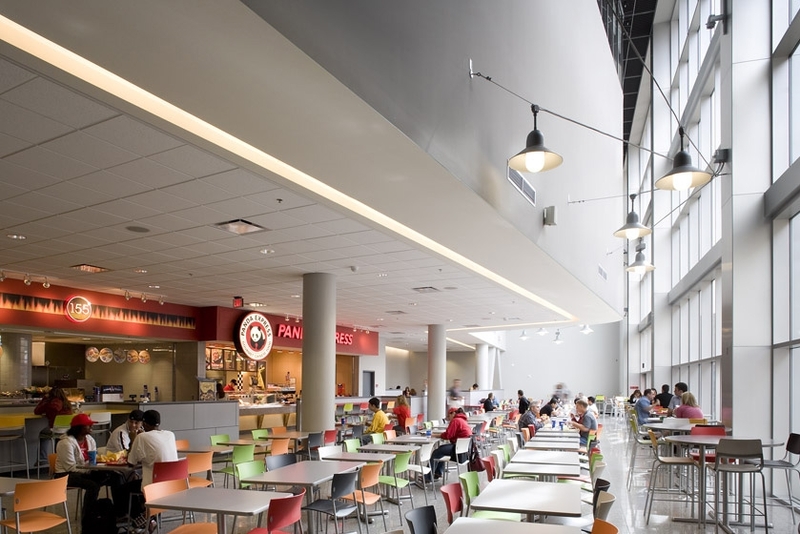 The building creates an environment where UNLV students can gather informally outside of the classroom, campus organizations can meet, events can be staged, and the public can visit. A major design challenge was to respond to the predominantly commuter based university population by creating an environment that attracts students to the campus and encourages their involvement in student life at UNLV. In partnership with Ellerbe Becket, this three-story facility provides spaces for diverse functions and groups. The ground level supports public activity with dining areas, student activities and services, a 300-seat theater, and retail spaces. Semi-public functions such as a computer lab, computer help center, student lounges, meeting spaces, and a ballroom are located on the second level. Offices for student organizations share the third level. On the north elevation, a 20-foot-wide balcony stretches the length of the building, providing a gathering place overlooking an existing plaza area. To the south, a large courtyard framed by the building is shaded with fabric canopies. This shading structure draws people toward the building, extends the dining space outdoors, and creates a stage for special events. The west half of the courtyard is terraced with 15-inch high concrete benches to provide amphitheater-style seating.